Well, it looks like I let this site go a year without a real post. Again. I’m going to bring it back, and in a tradition I’ve carried on since 1998, the first post in a year will be one with no useful content at all. You’re soaking in it. I’m currently debating what to do with this site. I might write more about what I do in my businesses (running web sites and, lately, iPhone development). Or I might just turn it into a list of links to things I write elsewhere. At any rate, something will happen here soon. I’ll at least update the categories. I just noticed “PalmOS” is still there. How embarrassing. I’m currently in San Jose for the excellent 360iDev conference. Working on an iPhone app, which will hopefully be published soon. Playing with my new iPad, which is either The Future of Computing or The Death of Creativity as We Know It depending on who you believe. I’m pretty sure I don’t agree with either side. I will post a full report on 360iDev soon, if nothing else. Stay tuned. In the meantime I’m occasionally on Twitter. Palm announced that the all-new Pre will run old PalmOS software. Microsoft hinted that they’re making a version of Office for the iPhone. Blackberry opened their own “App store”. The Texas State Senate added a provision to the state’s budget to prevent purchases of Windows Vista. CNET spent four months warning Windows users about a virus that turned out to have no impact at all. The Onion won a Peabody award. Twitter pretended that they waited three years after they launched to add a Search feature to their home page. Calling it “The Discovery Engine” was delightfully droll. Keep it up, guys! While these were pretty funny, none of them quite beats Google’s big announcement five years ago. Hopefully next year they’ll all come up with some better comedy. I’ve had an iPhone since last year, and being congenitally without a sense of direction, I’ve found the Google Maps feature particularly useful. After clicking the Maps icon, one click on the “locate me” button would peg the map to my current location. Despite not having a GPS chip, the iPhone would do an admirable job of finding my current location using cellphone towers, WiFi, and some sort of dark magic. Although this was good, I was really looking forward to using the maps on the new iPhone 3G with true GPS. I brought a new 3G iPhone home last week, gleefully clicked on the Maps and “locate me” buttons, and instantly found myself on a map centered on Wayzata, Minnesota. I’m sure it’s a fine place, but unfortunately, I’m 1300 miles away in Utah. It seems the “assisted GPS” in the iPhone 3G is getting the wrong kind of assistance. It uses cell towers to locate itself before using GPS, in order to speed up the normally slow GPS satellite lock process. This works for most people, but some of the 3G towers are incorrectly listed. 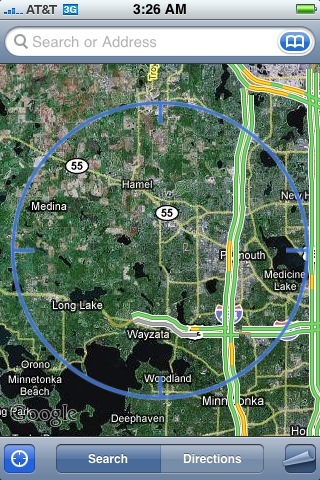 The one near my house, apparently, is listed as just outside of Minneapolis. This “assistance” overrides the GPS chip so I’m completely unable to get an accurate GPS location anywhere near my home. At first this seemed like an odd defect in my phone, but several other Utah locals, including my wife, have the same problem. In addition to Utah, it looks like there is at least one other glitch in the database: several people in Oregon have iPhones that believe themselves to be in Texas. As reported elsewhere, turning off 3G solves the problem. If you turn off 3G, then locate yourself on the map, it will correctly lock on. Unfortunately, as soon as I turned 3G back on and opened the map, it did a lightning-fast scroll across the country and brought me back to Wayzata, MN. Several of our friends say that resetting or restoring their phones solved the problem, but that hasn’t worked for us. I think it occasionally works because the phone reaches a different tower, or a non-3G signal, after resetting. I’m sure this can easily be fixed with a software update, but in the meantime, I’m not exactly thrilled by the iPhone’s GPS performance. Considering the lack of press, I think it’s a very isolated issue. Is anyone outside of Utah or Oregon having similar troubles? Update 2008/10/07: As of a few days ago, the problem is fixed. 3G gets me an estimated location quickly everywhere I’ve tried it, and GPS locks in shortly thereafter. This did not coincide with an iPhone update, so I think AT&T fixed something in their network.